While the outcome is unknown, one thing is for certain: There will be a steady stream of opinions from the media about how the election will impact the stock market. As we explain below, investors would be well‑served to avoid the temptation to make significant changes to a long‑term investment plan based upon these sorts of predictions. Predictions about presidential elections and the stock market often focus on which party or candidate will be “better for the market” over the long run. 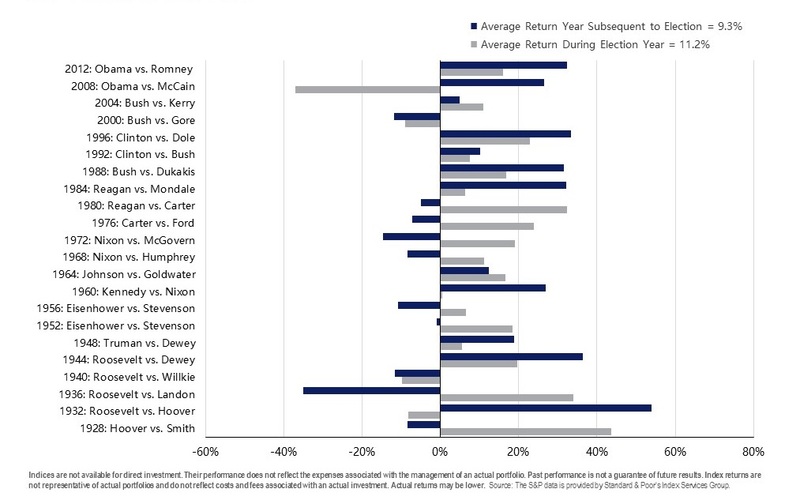 As depicted by the chart below, it is difficult to identify systematic return patterns in election years, but, on average, market returns have been positive both in election years and the subsequent year. Looking at the data in a different way, the chart below shows the growth of one dollar invested in the S&P 500 Index over nine decades and 15 presidencies (from Coolidge to Obama). This data does not suggest an obvious pattern of long-term stock market performance based upon which party holds the Oval Office. The key takeaway here is that over the long run, the market has provided substantial returns regardless of who controlled the executive branch.